Everyday we are constantly bombarded with tons of television commercials products that promise to help improve our memory, be it a brand of milk with “special” ingredients or daily consumption of vitamin supplements to boost the brain’s memory. However, it’s always a question to the effectiveness of these commercials gimmicks. The truth is it’s the memory muscles we trained each day that boost our memory. And you should not be too afraid that your memory will fail you. All it takes is a few simple techniques that will activate your brain cells. Keep your brain running. Exercise your brain muscles as often as possible by remembering facts, figures, descriptions, numbers, addresses, and the like. Connect all you need to remember with stories and mnemonics. Remember that your brain keeps on growing and developing, so you’ll need to feed it. Play some memory improvement puzzles, like crosswords and mind games to keep your brain at a healthy level instead of watching television. Learning new things is a good way to keep your brain muscles strong. You can start by learning a new language or a new musical instrument. Build up your physical body. The more you exercise the more oxygen circulate to your brain and heart. This can help prevent memory loss. Exercise can also help you feel more relaxed even during tense situations; and with relaxation comes a better chance of retaining the strength your memory. Control your stress level. Do you experience that stress can actually make you more agitated and tense, thereby, making you more prone to forgetting things. You have a difficult time focusing on things. Identify things that make you stress and try to avoid them as much as you can. If you still feel under the weather, you might want to seek professional advice and therapy. Seek to eat healthy. Food supplements may help you improve your memory; but, still, there remains no solid proof that these supplements actually work. Eating a healthy diet contributes to a healthy brain. This would help to keep your memory healthy. Try eating these foods as much as possible: blueberries, spinach, berries, and broccoli. Organizing your life. Planning your time well will also help you maintain your memory’s performance. Organize your phone numbers in your address book, place your keys in the same place, your wallet in your bag, and your reading glasses on your neck. You know what I mean. Allocate or create a place where you would find significant items, so that you can find them when you need them. Besides, knowing that these items are where they are reduces the clutter in your head and helps you focus more. Brain cells naturally degenerate over time. However, with all these hacks and tips, we can slow this process by living a healthy life and giving our memory leeway to perform better. 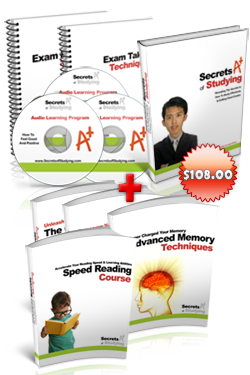 Discover the 7 Step Study System That Finally Reveals The Secrets to Score As’! 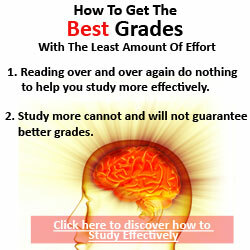 © 2008 How To Study Effectively & How To Get Good Grades. All Rights Reserved.